"As the subject of the language of worship was discussed in the Council hall over the course of several days, I followed the process with great attention, as well as later the various wordings of the Liturgy Constitution until the final vote. I still remember very well how after several radical proposals a Sicilian bishop rose and implored the fathers to allow caution and reason to reign on this point, because otherwise there would be the danger that the entire Mass might be held in the language of the people — whereupon the entire hall burst into uproarious laughter." In this intriguing bit of Holy Scripture, St. Paul assumes his readers know several types of compositions. 'Psalms' of course, are chanted in tones handed down from antiquity, treasures of the Church from her Hebrew roots. Hymns are familiar from common use and St. Paul even quotes one of the earliest a few verses before: ‘Awake/O Sleeper, rise from the dead/and Christ will give you light.’ But what are inspired songs? Inspired songs come white-hot out of deep, mystical encounters with Our Lord, are pounded while red-hot on the anvil of compositional techniques and cool into notation other musicians can read. Something is always lost in the process but enough is retained for the idea, like a fern leaf in amber, to be viewed and understood. In this category might be placed the songs of Hildegard of Bingen, the Eucharistic chants of St. Thomas Aquinas, the Kontakion of St. Romanos the Melodist and perhaps the ‘Altus Prosator’ of St. Columba of Iona. I dimly understand the music of these great ones from my own, lesser experiences, seated at the keyboard; half improvising, half in prayer, deep in meditation on some aspect of Our Lord’s life; seeing internal visions that lead further yet, until all was beyond my understanding and I was reduced to silence. The Five Mystical Visions came out of such experiences. By definition such songs are rare. Composers reach for their own harmonic language in such a moment and it is never adequate for the subject. Many times the music cannot be captured, but when it is, it’s quintessential worship. 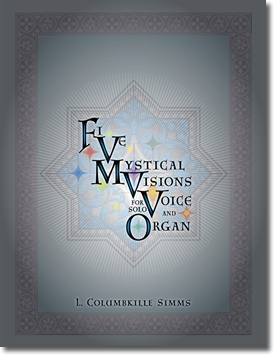 As a church musician of almost 40 years’ of service, I brought the Visions into my work as they came. The scoring was simple because my resources were simple: organ and voice. They’re not easy if narrow ranges and expected harmonies are wanted since good music is never easy, but a skilled singer and an average organist can use them in a variety of liturgical settings. Jeff Ostrowski, President of Corpus Christi Watershed, has asked me to write something about the Visions. This is hard. Some things can’t be told in words, some shouldn’t, and I prefer the anonymity of the choir loft. But I will share one story. ‘For the Lord’s Heart’ came out of a live improvisation during Holy Communion. After Mass a gentleman who was clearly used to getting his way approached me about having ‘that song’ done for his mother’s impending funeral. He was so earnest about it that I promised without telling him there wasn’t a note written down yet. The music was still in the ‘white hot’ stage and had not reached the ‘anvil of compositional techniques’, but I got on with it, quickly. I was also amused by the man’s requirement to have ‘the singer who sang it’ present, too – that would have been me – because while I had better singers in my choir obviously none of them knew the music or would be learning it in time, so he really had no choice. But, as I was to find when it was all over, the Lord had touched someone through that song and by so doing had confirmed the reality of His Presence. A few years went by and I was in another Music Director’s position. I brought out ‘For the Lord’s Heart’ to try with the new acoustics and a different organ. The experiment took place during a practice session when the church was empty. The only priest of the parish was a godly man nearing retirement, a man who had suffered much in service to Our Lord. He was getting the music program he’d always dreamed of during his last few years of ministry, so he occasionally came in to see what I was doing and stayed in the back pew to listen. A former military man, he was very gruff and disciplined, but tears ran down his face when he heard the song and I found myself promising, again, that I would provide it for a funeral: his own. When he retired, he took fully finished scores to put with instructions in his Will even though he couldn’t read music himself. Each song of the Five Mystical Visions has a story. Now that they are in print, it is my hope that stories will continue I will never know, of lives touched, hardship eased, visions of the reality and power of Our Lord passed on. Click here to hear audio samples or to purchase this collection.